Limoncello and pear vodka come together to create a delicious Tuscan pear cocktail. It's a fruity and refreshing lowball drink that's very easy to mix up and may become a new favorite on your personal cocktail menu. 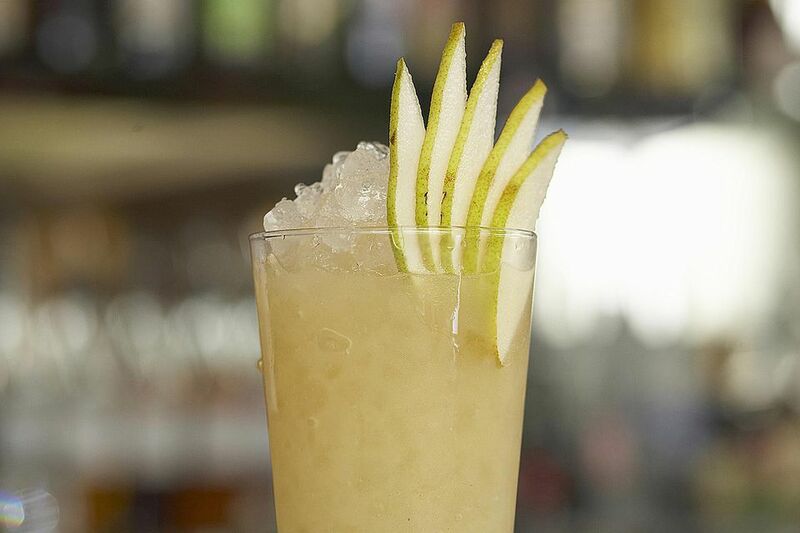 The recipe comes from Grey Goose and is designed to feature the brand's pear-flavored vodka (called La Poire). Its clean, smooth fruit flavor pairs delightfully well with the lemon liqueur limoncello and orange juice, while the ginger liqueur adds a brilliant sweet spice. The mint leaves and pear garnish are a finishing touch that adds freshness and a pop of color to contrast the bright yellow drink for a simple, elegant display. Rim an old-fashioned glass with sugar; wet the rim by wiping an orange wedge around it. Strain into the prepared glass filled with crushed ice. For the ginger liqueur, you have a few options. One of the most popular (and readily available) is Domaine de Canton. You might also want to look for The King's Ginger, as it's a fabulous spirit as well. Fresh-squeezed orange juice is highly recommended for this drink because it will match the bright flavor of the other ingredients. On average, you can expect to get 2 to 3 ounces from the average orange, leaving you plenty for a second round. If you have been buying simple syrup, consider making it at home instead. It's as easy as the name implies: A simple mix of equal parts sugar and water, brought to a boil, then simmered for about 15 minutes. Let it cool before making the drink. If you're in a rush and want just a little bit, shake up a small batch in your cocktail shaker. Dried pears are a nice garnish, but so is the fresh fruit. When slicing a fresh pear, dip each slice briefly in a little lemon juice so the flesh doesn't turn yellow when it's exposed to oxygen. There's no need to worry if you don't have an ice maker capable of crushing ice. You can toss some cubes into a blender and give it a quick whirl, draining off any excess water. Or, do it manually by placing cubes in a plastic or cloth bag (a Lewis bag is designed for this purpose) and whack it with your muddler. Then again, the drink is perfectly fine when served with regular ice cubes. This is a fabulous recipe to make by the pitcher and have ready in advance for a small party (or a quick drink for yourself). Determine how many servings you need, then multiply each of the ingredients by that number. Stir it up and store it in the refrigerator until it's time for the party. Either add ice cubes when you give the pitcher a last-minute stir or pour the punch over ice-filled glasses. How Strong Is a Tuscan Pear? The Tuscan pear has a delectable flavor that's almost too good because the sweet taste will make you want more of this somewhat potent cocktail. On average, the alcohol content should be close to 21 percent ABV (42 proof). It's not the strongest drink you'll mix up, but it's not the lightest, either.